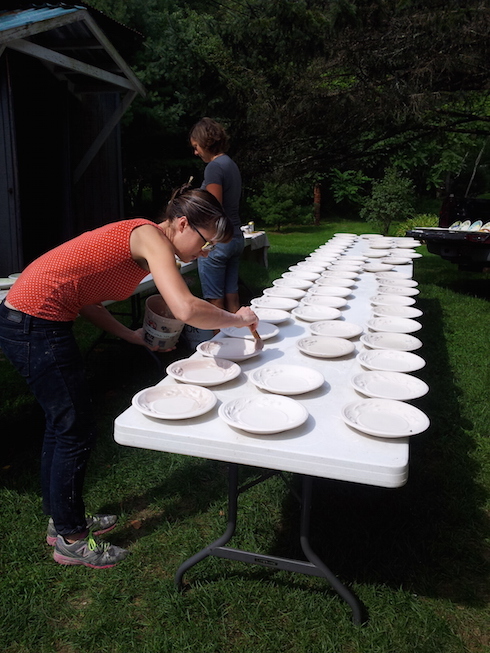 The Salad Days Artist-in-Residence is commissioned to produce 550 plates from Watershed’s indigenous earthenware for the Center’s annual Salad Days fundraising event–a community festival featuring locally sourced foods that draws hundreds of guests from Maine and beyond. The artist is selected by a jury in late winter prior to their residency and resides at Watershed from May to October, producing plates for the following year’s Salad Days. During the residency, the Salad Days artist receives housing in a private room, all meals, a large studio, free materials and firings, and a $500 stipend. Watershed provides opportunities for the Salad Days Artist to sell work at events and to exhibit in group shows. Salad Days artist plates gain broad exposure being featured both in Watershed print and online publications, and in local and regional press and advertisements.